This image and headline speaks more than thousand words. It is not strange and nothing unusual to hear or to have sentiments against your country. Thousands farmers die every year because they don't have faith in their country. Anti India slogans are raised everyday in parts of Kashmir and in Naxalite areas and anti India sentiments are also prevalent in those privileged citizens of this great country who have experiences of foreign holidays. They cursed their country for not having facilities, roads and systems like in countries they have visited so what has happened in Jawaharlal Nehru University ( JNU) that triggered a nationwide uproar and labeled all students as anti-national traitors? A program held in JNU campus to protest against the capital punishment suddenly turned anti-India and pro-Pakistan when few individuals shouted slogan in support of parliament attack mastermind Afzal Guru. It is highly condemnable act and no one either from students’ union or JNU administration is supporting it. Neither people like me who are standing in solidarity with arrested JNU students and attacked journalists are supporting such sloganeers. Akhil Bhartiya Vidhyarthi Parishad (ABVP) the student wing of ruling BJP then took things into its hands. They started beating all students by declaring them anti-national and traitors even before reporting this incident to university authority. The issue when fell in the hands of few BJP MP's all students who were not affiliated to ABVP became agents of Pakistani terrorist Hafiz Saeed. Delhi Police without any investigation and interrogations entered in hostel rooms and harassed students who they found anti-BJP. Kanhaiya Kumar the president of JNU student's union was detained on charges of sedition. The events that followed in the days ahead further let down the head of the Indian democracy. When Kanhaiya Kumar was presented in front of magistrate of Patiala House court, BJP members dressed like lawyers entered in magistrate’s chamber and attacked JNU students and reporters who were present there to cover the incident. 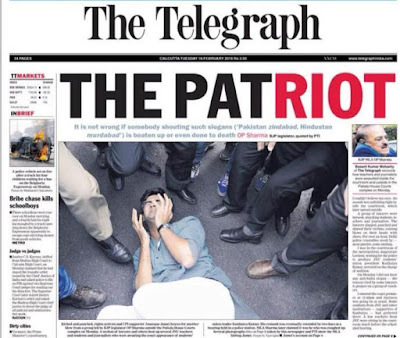 Mob of about five hundred people including lawyers many of whom were BJP members and a Delhi BJP MLA O.P.Sharma were attacking students and journalists outside the court. O.P. Sharma reportedly threatened to kill all JNU anti-nationals. These so called patriots try to suppress journalists’ right to report thus suppressing our right to know. Delhi Commissioner of Police Bhim Bassi seemed unaffected by this incident and dragged away his feet by saying things were under his control. His policemen in court complex remained mute spectators of attack on democratic values and these attacks mocking Indian judiciary are not anti-national for these so called patriots. The RSS-BJP opposed Left ideology of socialism and Anti-Brahamanwad due to which violent attacks are rampant in left dominated areas between both party workers but with this kind of attack on a reputed university without proper investigations is unlawful. Even if such speeches are made according to sedition law if a speech or gathering is not incitement to violence than it is not punishable. Moreover in this incident there are also videos which linked ABVP in orchestrating anti- national campaign. So actions should be taken after proper investigations and not in the heat of the moment. People should also note that every time there is a state election around, BJP and RSS tries to make it 'Us' versus 'Them' fight whether in the form of Hindus vs Muslims, Upper Castes vs Lower Castes or Anti-national vs Patriot. It is all politics of propaganda and I only appeal people of this country to understand this and act accordingly. I also pray to god for peace. I suggest Modi government to find ways of development, to uplift economy, to generate employments, to reduce inflation than to polarize for poll benefit. God Bless India. A very thoughtful and insightful article. Overall, A nice article with apt headline. 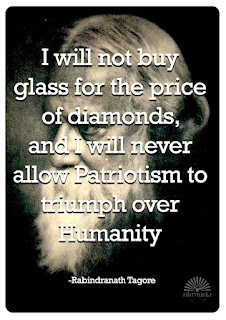 These so-called patriots have diluted the concept of patriotism. It's going beyond elections now; it seems to be about altering the country's history. Congratulations! Your blog post was featured in the Buzzing Blogosphere on Feb 22, 2016 at Blogadda.